No carrageenan in the food – take time to read the label! Looking at the above, you may be thinking “errr, well that rules out dry food then!” Unfortunately, you are right – it does. I know that it can be convenient to feed your cat dry food (particularly when leading a busy lifestyle) but there is no doubt about it – it is not good for your cat! OK, so knowing the above is a good start, but with tonnes of different brands out there (all with a unique twist) who promote different messages – where do you start? Well, I have done some of the hard work for you and listed outlined one of my favorites here. In every review, I sift through the brand’s website / nutritional information, conduct my own online research (other cat blogs etc.) and test the product with Giles. A super healthy cat food is one thing, but if your cat won’t eat it, then there is a bit of a problem. So…Which Weruva Cat Food Is Best? ​One of the things I love about Weruva is the fact that their website contains so much information about the nutritional content of their products. Weruva does a good job at trying to educate the consumer. On their website, they are clear that calories come from three places – protein, fat and carbohydrates. As mentioned above, protein is critical so it is great that their products contain a high percentage of it. Also, all of their wet cat food products contain about 80% water, so are purrfect for keeping your cat hydrated. ​Looking at their range of products – protein comes in the highest proportion compared to fat and carbohydrates, which is fantastic. Carbohydrate content is really quite low. When I first looked at the list of products on offer a few years ago, I was in complete shock. Weruva don’t produce or market a dry cat food. This is really important for me, as I am a big advocate of cutting down dry cat food intake, wherever possible! “Our base proteins of chicken, beef and fish include only top quality muscle meat, such as white breast chicken, whole tuna loins and select cuts of beef”. It would seem that they are actively living their philosophy to “fuel the carnivore”, which is great to see in a leading cat food brand. The cat diet rhyme on their website is also worth a read! But do their manufacturing processes actually match up to what they are preaching? 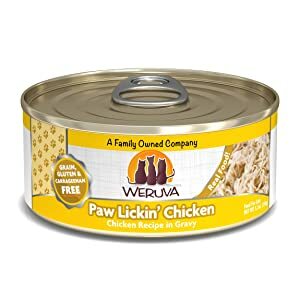 Weruva explain that their cat food is produced in human food facilities and according to human food processing standards. Having fed Giles Weruva food for a while, I like Weruva’s “what you see is what you get” mentality and I love that they are coming up with new recipes and blends all the time. It is worth mentioning, Ingrid King wrote a great review about Weruva and spoke directly to the owners to address a couple of her concerns. It was an interesting read and great to see how transparent the brand is. Giles likes all Weruva cat food products! However, he does have a clear favourite. ​In summary, I love Weruva cat food as it is an honest and well-respected brand. Their food is top notch and of the best quality. I tend to buy human-grade food that looks like it should and contains no nasty ingredients. Most of the cat owners that I speak to have tried Weruva and have nothing but good things to say. Oh and Giles absolutely loves their Paw Lickin’ Chicken recipe.